Hastings Highlands Councillors Tracy Hagar and Nancy Matheson after successfully obtaining a Seniors Community Grant through the Ministry of Seniors Affairs. “This will begin the process of becoming an age-friendly community,” said Matheson. The intention is to create awareness of local opportunities, programs and services available for rurally based seniors. “It will promote informed, healthy aging by improving access to information by seniors, introduce them to diverse recreational activities, fostering social inclusion and social wellness,” she said. Information was available at more than 20 interactive table displays and demonstrations covering everything from using walking poles to preparing a living will. Sandwiches, soup and dessert was provided during which time there was an interactive presentation by Bonnie Loranger, a diabetes nurse educator. 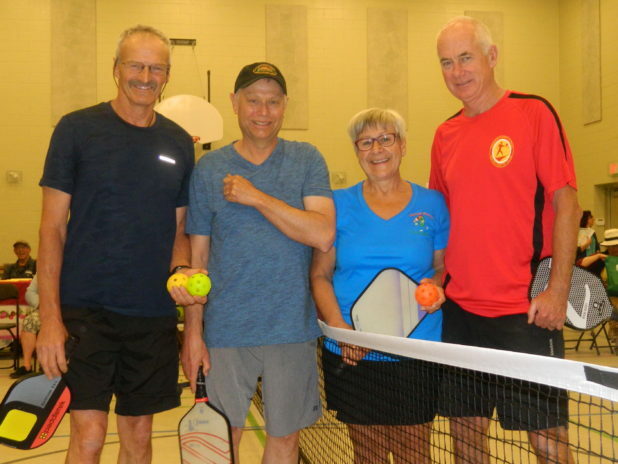 Following lunch, Dave Lear and three other senior athletes from the Haliburton area provided a demonstration of pickleball. He later admitted he was a senior. “All you need is a pair of running shoes, and a racket,” he said. The game has some similarities to tennis but is designed to be played injury free. Flo Bradey and Lorraine Franck took in a stencilling demonstration by Loyalist College. “We’re interested in anything new,” said Bradey who proudly admitted to being 80 years old and still driving her own car. “At my age, they don’t ask anymore if you are a senior,” she chuckled.